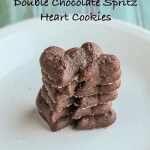 Double Chocolate Spritz Heart Cookies are the perfect treat for Valentine’s Day or just for the fun of it. Tender cookies, they are quite chocolatey but not at all too sweet. 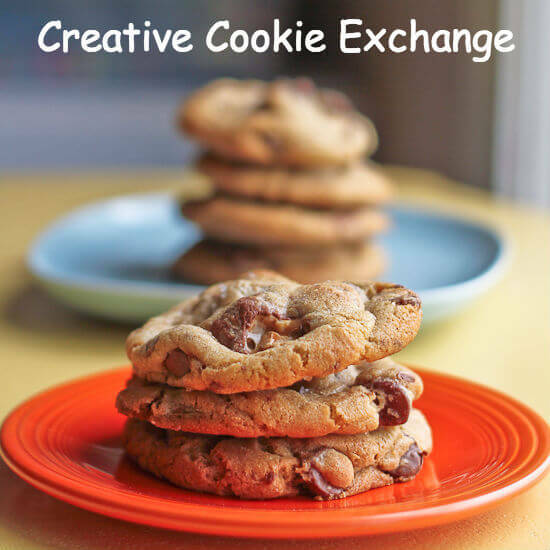 Keep reading for more great cookies for Valentine’s Day from Creative Cookie Exchange. Affiliate links have been used to link to items I am discussing in this post. Well, I did not get to my cookie press in time for Christmas or New Year’s, alas, but I did get it out in time for this month’s Creative Cookie Exchange! 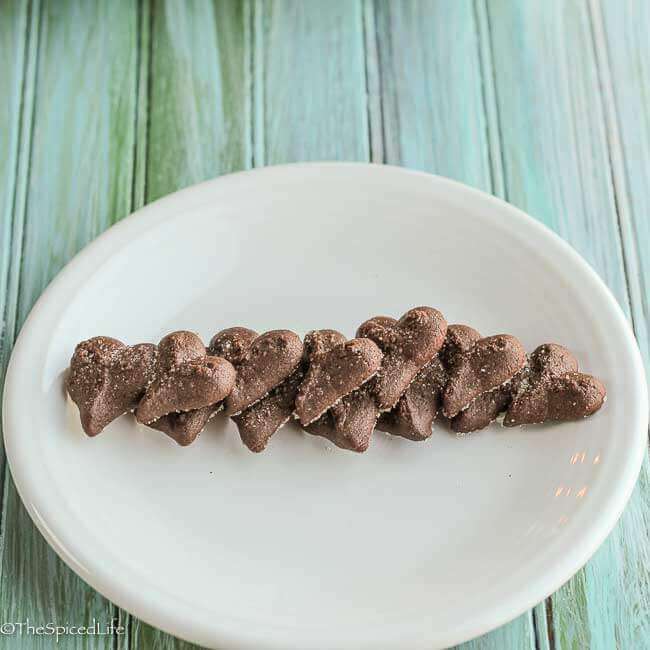 When I sat down to contemplate our theme, hearts and love for the upcoming Valentine’s Day of course, I immediately thought of spritz heart cookies, just because I had been bummed to not use my cookie press for Christmas this year. I intended to make single heart cookies, with the disc which comes with the OXO Good Grips Cookie Press. But then I remembered I had not yet had a reason to use my Springtime Disk Set , so instead I chose the double hearts disc–two connected hearts, as you can see. The other reason I had been dying to make spritz (or cookie press) cookies is because I really wanted to try a chocolate dough. I am in love with my basic vanilla cookie press dough, and I have really enjoyed playing with adding different flavors to it (check out these Holiday cookie press cookies for some flavor ideas that do not need to be confined to the holidays), but I was curious to see how a chocolate dough would work. The answer is pretty well, but not as smoothly as the vanilla dough. Now it could be you could try a cocoa powder only dough and it might press beautifully, but I really wanted melted chocolate in my dough. It could also be that as the cookies were getting baked, I should have chilled the dough while waiting. And while this dough was not amazingly smooth, it did still ultimately work. And was delicious for a rich and chocolatey but not at all too sweet change of pace! Adapted from Land'o'Lakes; this recipe is large because I was sending cookies into John's classes; you can cut it in half if around 100 small cookies is too many. Preheat the oven to 375 F. This many cookies will need to be baked in rounds; it will go faster if you can bake 2 sheets at a time. If you can, place the oven racks in the top and bottom thirds of the oven. Line 2 cookies sheets with silicone mats or parchment paper and set aside. Whisk together the flour, cocoa powder and salt. Set aside. Beat the butter until creamy in a stand mixer or with a hand mixer. Scrape the sides and bottom of the bowl, and then add the sugar. Beat until light and fluffy. Again scrape the sides and bottom of the bowl. Beat in the egg yolks. Scraping the bowl as needed, beat in the vanilla and milk. Add the cooled melted chocolate and beat it until well incorporated. Scrape the sides and bottom of the bowl. Add the flour mixture in 3 additions, slowly mixing it into the dough. If the dough is too soft to fill the cookie press, you may need to chill it first. I was lazy and left it out the whole time--but I might have avoided some problems if I had chilled the dough in between baking rounds of cookies. At any rate, fill the cookie press and press the cookies 1 inch apart on the prepared cookie sheets. Sprinkle the cookies with fine sugar. Bake for 9-11 minutes, until set. Let cool completely on the cookie sheets. 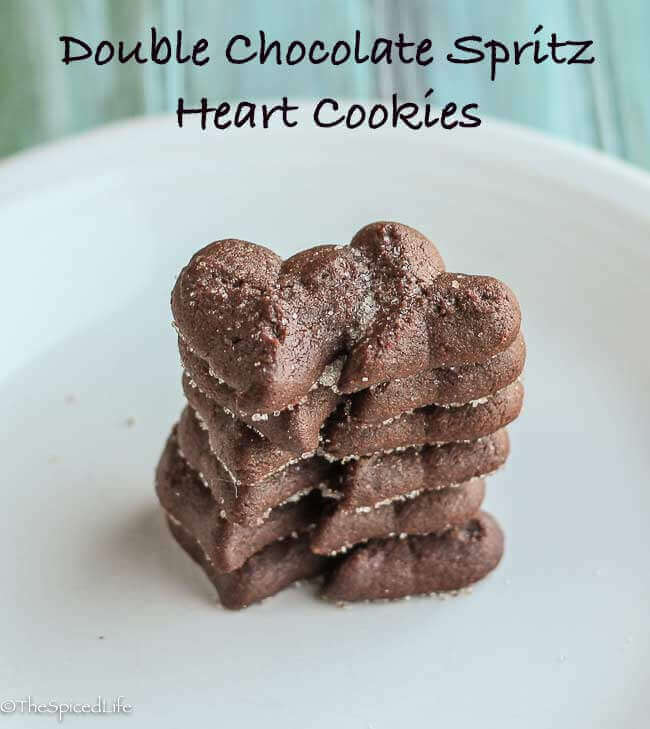 Double Chocolate Spritz Heart Cookies: perfect for Valentine’s Day–or use a different disc and make them Christmas cookies or cookies just for fun! Tender, not too sweet, and intensely chocolate! Anyone looking for a collage?…. I haven’t made a chocolate spritz cookie dough either. Nice suggestion to try using cocoa powder to make it smoother. I do need to get out my cookie press and use it again. Oh, and I like the double hearts. So cute! I think I have a cookie press squirreled away somewhere but if I don’t, I think I need to get one soon. These cookies are definitely worth a try. Laura , these look so tender and delicious. And super cute . So sweet, love the double hearts!! I came “this close” to doing a spritz cookie in chocolate! Great minds think alike. I am saving this recipe. These look sooooo good!! I think Spritz cookies are perfect year round and always appreciate a reminder like this one to try shapes that are not simply Christmas-related. Your double hearts are lovely! What a great idea! Love the addition of the melted chocolate. And they look so pretty! I wish I’d thought of my cookie press as I didn’t get to use mine for Christmas either. Spritz cookies are so fun to make! Love this chocolate version. These are cute, and the double heart design is a great way to change them up for Valentine’s Day. I inherited a vintage cookie press from my grandmother that I always forget about, in the back of the baking drawer. Time to get it out for your cookies, Laura! I’ll take your suggestion and use just cocoa powder though. These spritz cookies look very pretty! 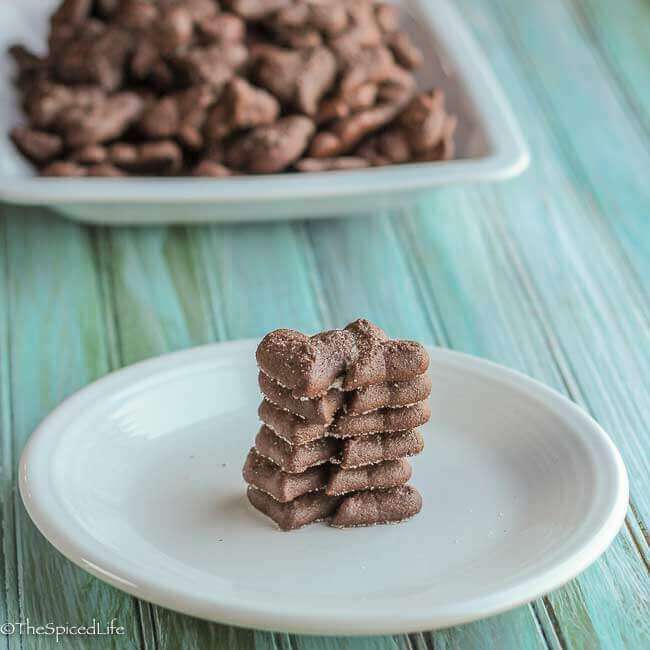 I have never worked with a cookie press before, time to try and I love that you have used melted chocolate…makes the cookies taste extra yummy! I love, love, love spritz cookies! I’ve made them once about 5 years ago then never made them again! These look delicious! These are so sweet!! I’ve never made spritz cookies, but all the more fun! These cookies are beautiful, I really love spritz cookies! Adorablicious!!! And I never heard of cookie press cookies referred to as spritz–thanks for the learnin’! I’ve never had chocolate spritz cookies! These look great! I would have loved to be the recipient of these amazing cookies. The double hearts are just so darn cute and I can never resist a chocolate cookie.